Recently, there was a debate in the Mexican Congress on the proposal to monetize the Silver Libertad Coin. The debate took place during a forum for “The Promotion of Savings for Mexicans.” If Mexico decided to monetize its Silver Libertad Coin, it could have a severe impact on the silver market and price. …. if the price of silver should shoot upward, Banxico would have to issue new, higher quotes for the “Libertad” silver ounce (according to the formula to be established by Law). In this way, again, the coin will remain “in circulation”, and since it has no nominal price stamped on it, it will avoid ending up – like all the old silver coins that had stamped values – at the refineries. The important feature in the proposal to monetize the Silver Libertad was that the Central Bank of Mexico would adjust the value of the coin based on the price of silver, rather than striking a permanent numerical value on the face of the coin. By basing the value of the Silver Libertad on the market value of silver, this would protect the Mexican citizen from the ongoing devaluation of the Peso. 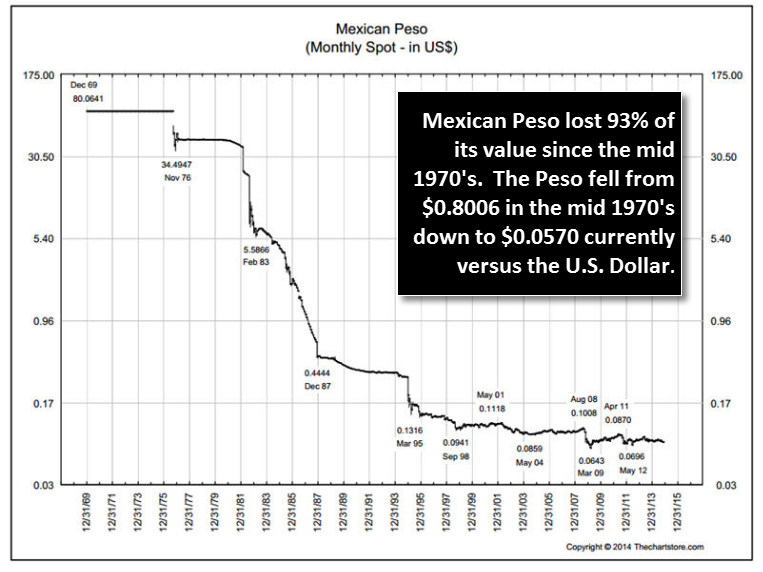 The Mexcian Peso was valued at $0.8006 to the U.S. Dollar in the mid-1970’s but is now trading at $0.0570. Thus, the Mexican Peso has lost 93% of its value in just the past 40+ years. We can see the devaluation of the Mexican currency much better by looking at the relationship between the amount of silver contained in each coin versus the number of Pesos struck on the face of the coin. The Peso minted between 1869-1913, contained 0.786 (oz) of silver in the one-ounce coin. The value struck on the front of the coin was 1-Peso. However, if you look down to 1950, the 1-Peso coin only had 0.1286 (oz) worth of silver in it. 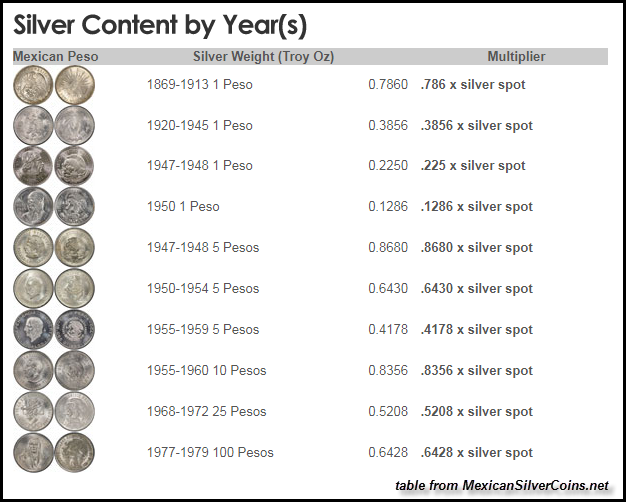 The amount of silver contained in the 1-Peso coin was six times less in 1950 than compared to 1913. Now, by examining the amount of silver in the 1913 1-Peso of 0.786 (oz) versus the 100-Peso (1977-1979) of 0.6426 (oz), we can see that there was only 0.00642 (oz) of silver backing 1-Peso in the late 1970’s than the 0.786 (oz) of silver backing the 1-Peso in 1913. Please understand that the Central Bank of Mexico stamped 100-Peso on the face of the coin with only 0.6426 (oz) of silver contained in it. Thus, the Mexican Peso lost 99.2% of its silver content between 1913 and 1977. I did not do extensive research on all the silver coins produced by the Mint of Mexico in 1943, but I would imagine there were others. 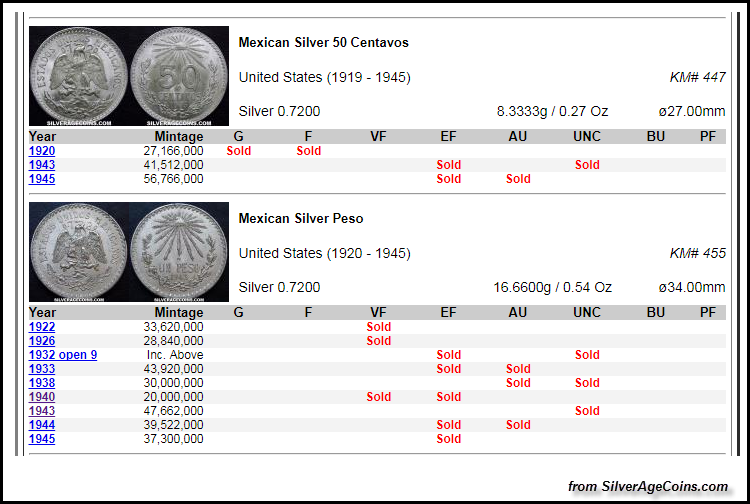 For example, I found on the same website listed above that 3,955,000 of the Mexican Silver 20 Centavos were produced in 1943 as well. However, the amount of silver in each of the 20 Centavos was only 0.08 (oz), which netted a total of 316,400 oz of silver consumed. Regardless, the Mint of Mexico produced one heck of a lot of silver coins during that period. Now, if we consider that the Mexican government consumed 26.5 Moz of silver to mint the Silver Peso and Silver 20 Centavos coins for a total population of approximately 20 million in 1943, how much silver would they consume to protect the value of its current 130 million citizens? Thus, Mexico consumed 30% of its domestic mine supply just to produce two of its silver coins in 1943. Furthermore, the population of Mexico at the time was approximately 20 million. Thus, the Mint of Mexico consumed 1.3 oz of silver in the Peso & 50 Centavos coins for each citizen. That’s a lot of silver. As we can see, the Mint of Mexico produced 800,000 oz of Silver Libertads versus 40.3 Moz of Silver Eagles fabricated by the U.S. Mint last year. The irony about those two figures is that the U.S. had to import silver to produce the 40.3 Moz of Silver Eagles as its domestic mine supply was only 35 Moz. On the other hand, Mexico produced 186 Moz of silver in 2016, more than five times that of the United States. Something is seriously wrong here. Why is Mexico exporting all of its silver for worthless fiat money if its citizens could acquire domestically minted Silver Libertads to protect their wealth in the future? I would imagine the U.S. government has something to do with controlling Mexican officials in keeping their citizens entirely in the dark about silver as MONEY and a STORE OF VALUE. If the Silver Libertad was monetized and 30% of Mexico’s silver production was used to produce these coins, as it was in 1943, it would consume nearly 56 Moz of the country’s domestic mine supply. Moreover, with a population of 130 million in Mexico, 56 Moz of Silver Libertads would amount to less than a third of an ounce of silver for each citizen. While it is an excellent idea that the Silver Libertad is monetized as protection for Mexican citizens against the ongoing devaluation of the Peso, it will be an uphill battle in state politics. Unfortunately, the world depends on a lot of silver coming from Mexican mines to supply the global jewelry, electronics and investment industries. If its citizens consumed a significant portion of Mexico’s silver production in acquiring vast numbers of Silver Libertads, it could severely impact the silver market and price. It will be interesting to see how far this proposal to monetize the Silver Libertad goes in the Mexican government. Peru became the world’s largest producer of silver in 2012.